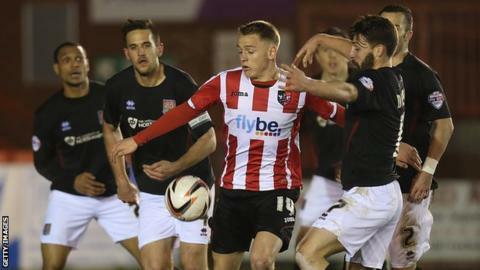 Striker Eliot Richards has said he would consider a permanent move to Exeter City in the summer. The 22-year-old is on loan from League Two rivals Bristol Rovers until the end of the season, when his current contract expires. He moved to Exeter on loan in January and has scored five goals in 17 games. "I've enjoyed my time and if the deal's right, and everything goes well, I'm more than happy to come back down," he told BBC Sport. "I've come down and played in more of my position. The team suits my way of playing and I've done well, scored goals and hopefully there's many more to come. "Hopefully we have some meetings when the season finishes and everything's done," Richards added. Exeter boss Paul Tisdale would not comment on whether he would offer Richards a deal, but praised the impact he has made at the club. "He's done extremely well for us," said Tisdale. "We will judge the situation in a week's time once I know the full extent of the possible spend for next year. "But until that happens I'm not prepared to say, nor can I say."